One of my favorite things about simple livin’ is seasonal menus. I don’t have to spend a lot of time planning what I will make because when the pears are ripe we will have things made from pears, when the tomatoes are ripe we will have wonderful tomato dishes etc. Well it’s rhubarb season at the moment and after making the traditional rhubarb dishes like rhubarb pie and rhubarb jam, and tucking some away in the freezer for a mid-winter rhubarb fix, I decided to do some experimenting. I started out with a traditional muffin recipe but…well, I just can’t help myself. I tweaked and substituted my way into a completely different recipe and these breakfast muffins are scrumptious as well as healthy. Preheat the oven to 350 degrees. Grease two 12 cup muffin pans or line with paper cups. In a medium bowl, stir together the flours, flaxseed meal, baking soda, baking powder and salt. In a separate bowl, beat the brown sugar, coconut oil, egg, vanilla and kefir or buttermilk with an electric mixer until smooth. Pour in the dry ingredients and mix by hand just until blended. Stir in the rhubarb, berries and walnuts. Spoon the batter into the prepared cups, filling almost to the top. Sprinkle top of each muffin with raw sugar. Bake in the preheated oven until the tops of the muffins spring back when lightly pressed, about 25-30 minutes. Cool in the pans before removing. Holidays – It’s the most wonderful time of the year!! Holidays – It’s the most wonderful time of the year! For most of us the holidays are the most wonderful time of the year. Warm cheerful faces. Good will toward our fellow man. Family and Friends sharing a meal prepared with love. Children filled with giddy anticipation. These are the things we are thankful for. But what to do with all those leftovers. Personally, I like to invite the less fortunate to share in our family warmth. Sharing good food and fellowship. There are so many ways to use all those leftovers but sadly the sweet potato seems to be left out of the creative process of making the old into something new and delightful. This started me thinking of ways to truly use up ALL of those leftovers, including the sweet potato. The following recipe is good for Mini loaves of sweet potato pineapple bread for gift giving or breakfast muffins. Mix well. Fill greased muffin tins or mini loaf pans. Bake in preheated 425 degree oven for 25 minutes. Cool. Dust with powdered sugar (optional). These are sure to bring smiles! Enjoy! Posted on November 16, 2014 July 24, 2015 Categories Back To BasicsTags Back To Basics, breakfast, cinnamon, Ginger, healthy, home brewed beer, homemade, ingredients, kefir, leftovers, muffin, organic, probioticLeave a comment on Holidays – It’s the most wonderful time of the year!! Occasionally, folks will see me cook and be amazed that I seem to throw together ingredients together randomly and make something scrumptious. My secret? Making recipes with as few ingredients as possible and developing base recipes that can be adapted with 1 or 2 minor changes or additions. For instance, remembering my sourdough bread recipe is simple, it has flour, water, salt and sugar. It’s kind of hard to forget any of those ingredients. I’ve been experimenting with sourdough and trying to combine it with my love of breakfast muffins and healthier alternatives. If this statement sounds like I’m not willing to compromise on taste, health or ease of preparation, that’s because I’m not. By using “good” ingredients the end result is a rich and robust flavor. That said, I do use “sugar” in my recipes. Is sugar bad for you? My personal opinion is “yes” sugar standing on it’s own merit is probably a bad choice but adding fiber to slow the uptake helps make it not as bad. Using a sweetener that has vitamins like honey is better because honey had nutrients. I use sugar in my recipes but cut the amount and substitute part of the sugar with Stevia to reduce the calories. This recipe is a base sourdough muffin recipe with different adaptions. Run with it and explore the possibilities. Let me know what combination you try!!! As I come up with different variation of this basic muffin recipe I will add notes to the bottom of this post. Combine wet ingredients in medium bowl. Add dry ingredients to wet ones and mix. Prepare your muffin cups by greasing and flouring them. Quickly spoon batter into your muffin cups. Bake at 425 for about 25 minutes. Cool. Enjoy. Makes 12 muffins. *Note: I tried a new twist on these today. I substituted 2 large mashed bananas and 3/4 Cup chopped walnuts for the berries and added 1/3 cup additional flour to make up for the extra moisture. 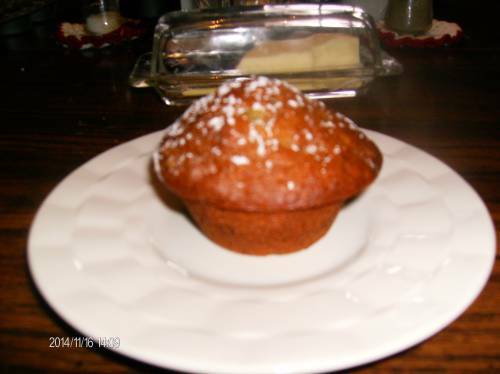 Presto … Banana Nut Muffins. It yielded a bit more than a dozen muffins but I just put the extra batter in a greased and floured mini loaf pan and made a cute little miniature banana bread. additional note: I modified this recipe again to make corn muffins by ommitting the fruit 1/4 cup sugar and vanillia and nuts and substituting the 1/3 Cup of Whole Wheat flour with 2/3 Cup Yellow cornmeal. Instead of greasing and flouring the muffin pans I only greased them. What a great side to go with a hot bowl of chili on a brisk Autumn Day! Enjoy! additional note: Well, we’ve had our first hard frost and the winter apples are now ready. I peeled, diced, cooked and cooled about a cup of Winesap apples into a lumpy applesauce. I used this in place of the fruit and added 1/2 cup chopped walnuts and a teaspoon of organic cinnamon. Once I filled the muffin tins I sprinkled the tops with a finely chopped walnut, brown sugar and cinnamon mixture and then baked them. I must say these are the best breakfast muffins EVER! 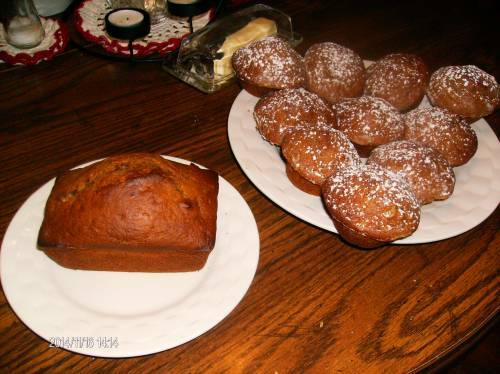 Posted on September 25, 2014 November 16, 2014 Categories Back To BasicsTags apple, banana, breakfast, chili, cinnamon, cornmeal, healthy, ingredients, muffin, organic, recipe, recipes, sourdough, whole wheatLeave a comment on Breakfast Anyone?